Send the list to the Library for processing. On your list, scroll down to the item that you’d like scanned, then click on the link to add tags to item. The digitisation request tag will appear on the list; click on it and then hit save. If you go back to the list, you should see that ‘Digitisation request’ now appears beneath the item. This tag is only visible to academic and library staff. Click on the item and scroll down to the ‘Library discussion’ section. Click on the link to Send a note to librarian, then tell us which pages you need and click on comment. This is an important step! If you don’t send your list to the Library, we won’t receive a notification that you’ve asked for a scan. 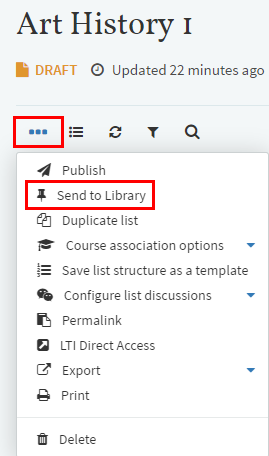 When your list is complete, click on the three dots at the top of the list (for reading list options), then click on Send to Library. When you send your list to the Library, we can start processing it: as well as scanning your items, we’ll also check links, move books and making any necessary purchases. If your request is covered by the CLA licence, the E-reserve team will provide a scan and add a link to it to your resource list. If there are any issues, they will get in touch with you. For further details about the E-reserve service, have a look at their pages on the Library website. This entry was posted in Uncategorized on June 20, 2017 by Louise Dutnell.